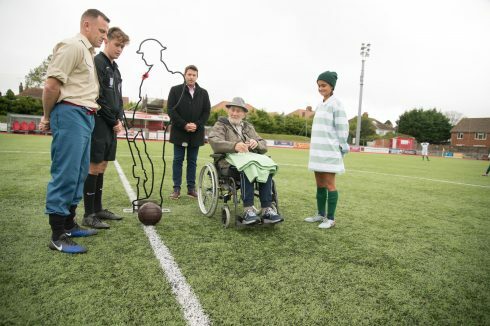 On Sunday 14 October, a very special football match was held at Worthing FC to commemorate an historic match that took place at the club 100 years ago, and to support Worthing-based charity, Care for Veterans. Sunday’s Grand Football Match, as it was also originally called, aimed to be as authentic as possible, with WWI-themed atmosphere and refreshments. Spectators were encouraged to come in period costume from the 1900s, with prizes for the best-dressed up for grabs! There were also live performances by Lancing Brass Band and 1066 Pipes & Drums marching band. The original game, in March 1918, was between Worthing Ladies’ XI and wounded soldiers from the Grange Auxiliary Hospital. Despite their various disabilities, the men were obliged to play with their hands tied behind their backs! 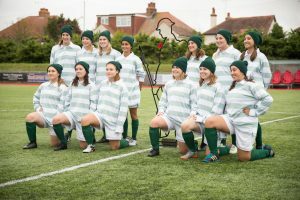 This commemorative match was between serving soldiers from The Princess of Wales’s Royal Regiment and the University of Sussex Ladies’ Team. 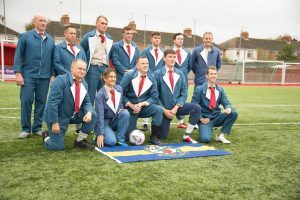 Both teams dressed in costumes of the period and played an extremely competitive match, with the soldiers taking the eventual win 9-7. Care for Veterans celebrates its own centenary next year, as the charity was established back in 1919 to care for those returning from World War I with life-changing disabilities. Since then, the charity has provided long term nursing care, rehabilitation, respite and award-winning end of life care to disabled ex-Servicemen and women from the RAF, Army, Royal Navy and auxiliary services. You can see all of the photos of the Grand Football Match on our Facebook page.